After the financial crash of 2008-09, investors have been faced with many reasons to stay out of the public markets. The incredible level of greed that caused such a collapse and the resulting damage to investors’ portfolios may push more and more capital into fixed income strategies to preserve capital and generate income. Some investors may prefer to earn little interest in a money market account or a small return from Certificate of Deposits, than to lose capital in the markets. Many retirees have been through unnerving volatility and have been advised to have a larger portion of their portfolio in unsecured corporate bonds than stocks. This strategy may generate income and provide a hedge against stock market volatility, but the bond market has shown that it, too, can provide more volatility than the yields warrant. We witnessed many corporate defaults during the crash that shed a new light on the risks to the unsecured bondholders. An unsecured bond is a bond from a public company that you can buy individually or in a bond fund. Either way, it is nothing more than a promise to pay a stated dividend, monthly or quarterly, and repay the principal upon the bond’s maturity date. If the company fails, you are a creditor in second to last place in line to collect. Investors have little recourse if there is nothing left to pay the creditors. Investors are willing to provide this unsecured debt because of the credit rating and corporate balance sheet of the company. The majority of individual portfolios consist of investments in publicly traded companies. It could be a stock or a bond, but the underlying company you are investing in is public. However, there are other investment options in the debt or equity of private companies. Both large institutional and the ultra-wealthy investors have access to these investments and utilize them to diversify their portfolios. We have all heard of the term “Private Equity” or firms that are Private Equity Firms. What do they do that is so special? Why are these investment opportunities only available to institutional or ultra-high net worth investors? They provide a key advantage to investing in private companies. Fewer investors and much less competition for investments may result in better terms and better overall returns for investors. Gaining access to these opportunities may take a team of specialists to quickly analyze these transactions and deploy large pools of capital to fund the investment. Remember, these are not public companies, and they do not disclose their financial information to the public. In order to make any investment decision, debt or equity, you need to do extensive due diligence. This is precisely why these investments are normally offered to large institutions like endowments, pension plans, and large financial institutions. This has made them virtually inaccessible to the retail investor. One specific and easy to understand asset class available is the senior secured loans. The reason for the “senior” is that they are in the first position in the capital stack. This would put them ahead of the unsecured debt, preferred equity and the stockholders. If something were to go wrong with the company, the senior secured loans would be backed by collateral much like a mortgage is backed by a house. If the company cannot repay the secured loans the debt holders could recoup their capital by selling assets pledged as collateral. This does not mean that the assets could not be sold for less than the debt owed, much like a house in this market, but at least some collateral would be available to mitigate losses and you would be ahead of the other investor classes. 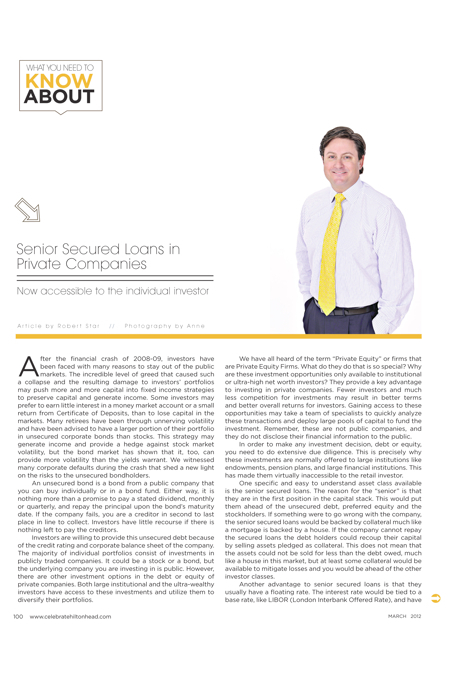 Another advantage to senior secured loans is that they usually have a floating rate. The interest rate would be tied to a base rate, like LIBOR (London Interbank Offered Rate), and have a fixed spread above the floating base rate. So if interest rates were to increase, so would the rate on the base rate, and the spread would be protected. This limits the loss in value to the investors. As you may know, a fixed rate loan, like a treasury bond, will lose value as rates go up. So a floating rate on senior loans can act as a hedge against interest rate hikes and inflation. When bond rates change, the principal value on the secondary market for bonds may fluctuate in price: the higher the price, the lower the yield and vice versa. If you invest in high investment grade bonds, you should have confidence that the principal will be returned at maturity, but they can offer little yield. So you may think it’s worth buying bonds with some yield, such as high-yield corporate bonds or even junk grade bonds that may have really high yields. These bonds would be under the secured bonds in the capital stack. The reason you are getting the higher yield is because of the perceived risk in getting your principal returned upon maturity. It is no different from someone getting the higher interest rate on their mortgage because they have a low credit score. Investing in private companies can increase your available options when allocating funds from a portfolio. This provides large investors the opportunity to better diversify with asset classes that are not correlated. Market volatility driven by emotional trading on current events has an effect on the values of public securities. Investments in private companies are not subject to the same short-term volatility. The investment is tied to the value in the underlying assets and the performance of the company. Even though an investment in a private company can present a high level of risk to your principal, the bonds readily available to retail investors may also come at high levels of risk. Remember, they are unsecured. Who gets paid first? There are not many ways for the individual investor to access secured bonds, but due to new regulations and the demand from the individual investor, options are now available. Unfortunately, these funds are not well marketed by the large financial institutions, as they would prefer to keep client accounts invested in the public markets. This allows their trading departments to trade securities rather than place capital in longer-term investments. As with any investment, there is risk of principal and loss of income. You should evaluate the opportunities on your own or consult with a financial advisor who understands the merits of adding secured bonds to your portfolio. Robert Star is managing director at EDI Private Wealth Group. For more information, call (843) 815-6636, or visit edifg.com.